Most people know that smoking can cause serious problems to your respiratory and cardiovascular system. Heart attacks, strokes, COPD and asthma are some of the more common diseases that have all been linked to long-term tobacco use. But it’s not just your lungs and heart that suffer from the repeated use of tobacco. When it comes to your mouth and teeth, tobacco can create a lot of problems. According to WebMD, bad breath, stained teeth and white spots inside the mouth known as leukoplakia are just a few of the minor oral problems that are attributed to smoking. Any type of tobacco product can cause the teeth to decay. When the teeth are constantly exposed to tobacco, tartar can develop and eat away at the tooth’s enamel. If untreated, tooth decay can cause severe discomfort and even lead to an infection. 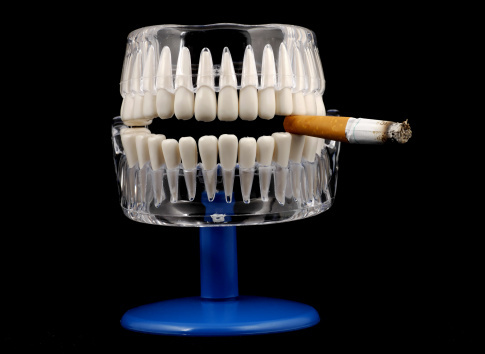 Smoking can also affect the gums and the bones that attach the teeth to the jaw, leading to tooth loss. If your gums appear to have receded or if your gums are tender and bleed easily, this may be a sign of periodontitis. Additionally, smokers tend to have more trouble with dental implants since tobacco risk increases the likelihood of infection. The likelihood of developing oral cancer, throat cancer and esophageal cancer are significantly increased by smoking or using forms of smokeless tobacco. According to the National Library of Medicine, oral cancer can affect the lips, gums, cheeks, tongue, palate or floor of the mouth. Sores or bumps inside the mouth can be signs of oral cancer. Often times, treatment involves the removal of tumors that have developed inside the mouth along with chemotherapy treatment. In some cases, the treatment can affect one’s ability to chew and speak. Be the first to comment on "Smoking and Your Teeth"